A fantastic Cinderella, rags-to-riches story is at the origin of Château Simian. At around 1920, Sophie Simian, having no direct successor, left her vines to a dedicated worker, Marcelle. Marcelle went on to grow the vineyard with her husband, and their daughter married Yves Serguier in 1955, who was already a grower. In 1981 Yves’ son, Jean Pierre took over his family’s estate and realized the dream of four generations of winemakers: the maturing and bottling of wine on his own estate. 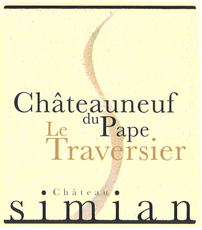 Today, Château Simian has three generations working side by side: Yves, Jean-Pierre, and his son Florian. The estate owns twenty-five hectares of vineyards, six of them in Chateauneuf du Pape. Certified Biodynamic, and practicing since 2008. The vines haven’t seen herbicide since 1994. Vinification Method: Hand harvested, destemmed before being crushed and put into cement tank. Macerated for 20 days with daily punch-downs. The wine is moved into demi-muids after the winter and spends 8 months there before going back into cement tank. The wine is bottled the second spring after harvest. Vinification Method: Hand harvested, destemmed before being crushed and put into cement tank. Fermented for about 10-12 days with daily punch-downs. Vinification Method: Hand harvested, destemmed before being crushed and put into stainless steel tanks. Macerated for 10-12 days with daily punch-downs. The wine goes through a few weeks of cold stabilization and is filtered before bottling. Vinification Method: Machine harvested grapes are destemmed and lightly punched down by hand for 3-4 days at a low temperature. The skins are lightly pressed and the wine is fermented in cement tanks. The wine is kept at low temperature in stainless steel for a few months for elevage and then bottled.